I smelt my way to this game. There was a smell of burning dead rubber. The sun was going down, as was any sense of fair play. The pitch was longer than I recalled. It was muddier, not even a blade of 7 o’ clock grass. The fielders were murky, far off, on either long on or long off. 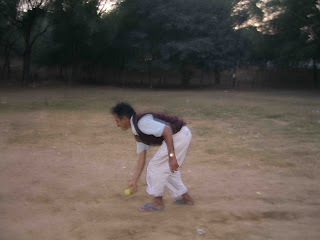 I was still at a second slip, not that I was fielding. Then this guy jogs in a few paces to bowl. Why, I will never know. So, he jogs in, and then underarms the ball. Somewhere else, Sehwag bites away at Greg Chappell. Why, I will never know. Maybe he is naïve. Maybe he is meant to say stuff. Will he be gagged, I doubt it. Sehwag, every now and then, when you least expect, shoots his mouth. Not that there’s anything wrong with it. Or was this BCCI’s ventriloquist act? Back to the game: That underarm ball. 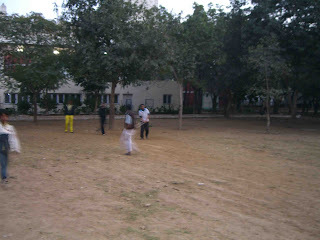 The batsman, before delivery was already half way down the pitch. It doesn’t matter. That flat-liner of a ball is a dead loss. To make good contact, get elevation, he’ll need to hit it out of the bowler’s hand. I’m asking the huddle around the tree wicket, is this a surrah (under-arm ball) match? It is. Three overs each. Wait until dark. And play the Greg Chappell Foundation match. Before that, it’s Ricky’s number – they play for money. Ten bucks a guy. The game gets over. I playact like some cricket hobo, starved for strike. Make him bowl round arm. One more, boy! C’mon, one more, boy. And they’re about to start the GC-Ricky match now – underarm money. I produce a camera. They produce a spectacle. Straight out of Lord of the flies. Abusing each other’s mothers, sisters and grabbing at each other for some camera space. I look forward to play with these guys tomorrow. Will head out with ten bucks. But leave my manners behind. Has this foundation done any good to date? Even though it was with good intention I am sure. Well well NC, some charity work, Im impressed. Your olfactory senses betrayed you but should stand the players in good stead since any GC Foundation matches are best played in the dark! NC, i think u r currently the front runner for the Johnny Walker globe trotting crickt fan competition. If you don't know abt it, let me know so I can forward u the details. Sraghuna, in the dark indeed. cheers Q. Checked it out.